In addition to the bread making and the butter churning, this year I have also begun running kitchen experiments in alcohol production. My first batch of strawberry wine was a disappointment–fully attributable to user error, I’m sure–but my subsequent stabs at short mead were much more encouraging. I stumbled on little kits from Ambrosia Farm that included a tea flavoring and a bit of yeast at last year’s Renaissance Fair–just add water and honey! Though I wasn’t expecting much from them other than entertainment, they were actually very tasty. Now I am hooked. Due to interest (mine) and wrist injury (my friend Scott’s), I had the chance to serve as an apprentice homebrewer last weekend on a 5 gallon batch of beer. 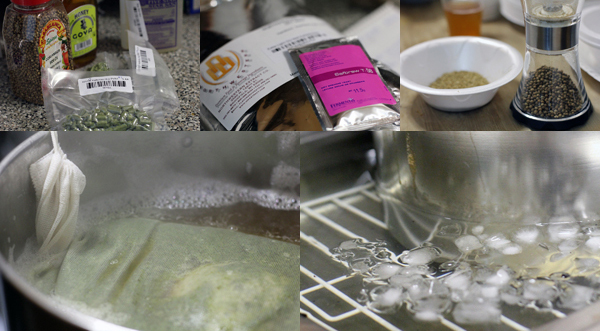 We followed the grand cru recipe from “The New Complete Joy of Homebrewing” by Charlie Papazian. Luckily for me, Scott knew exactly what he was doing, as I had not a clue. I am slightly worried to report that I now find this process immensely interesting as well. What can I say: I love food science. Then on to making bread from spent grain. You can do that?!?! Oh, dear. I am in trouble now. I am now dying to try making mead… it does look very complicated though… good for you and brave to try making wine! Making the mead out of the kit was really a breeze, actually. You only boiled a few cups of tea, not the whole thing, and it was all contained inside a gallon of spring water, so no sanitizing of equipment or anything. 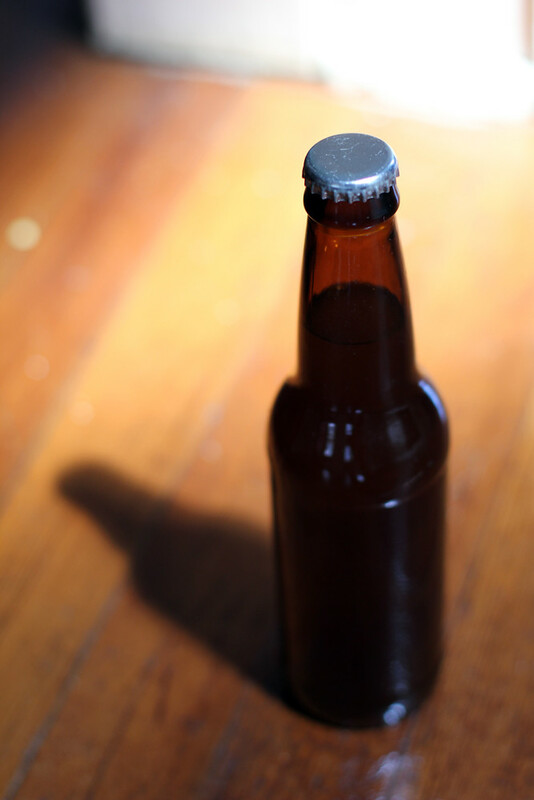 Because of how quick it was brewed and bottled, it never clears, but the taste was lovely and a little fizzy if left in the fridge firmly capped. Now that my packets are gone, however, I’m on to creating my own recipes/system. Hopefully, the bravery will kick in here as well. Deana, the mead we had at the supper club was nice and light, a touch effervescent. We were going to serve it with a rosebud dropped in the glass, but that was deemed over the top. Molly, yes you can made bread from the spent grain. I’ve had some and it was delish. You can bring all your experiments together. Moll…have not heard yet…how did you like [or dislike] the ” Viking’s Blod”? I thought that it was Dyn-O- Mite. Dansk Mjod’s “Viking Blood” mead is very tasty, and definitely more refined and heavier than what I am producing in my closet. I like both, but comparing would be like grading a sipping whiskey against a Pimm’s Cup, or, um, something like that. With both my hands busy during the bottling process I didn’t get my usual step-by-step pics in, but two weekends later we end up with 5 gallons (two full boxes of bottles worth) of homebrewed beer neatly capped and stored. And I helped. Initial sample proved quite tasty with forward notes of honey. Only a week or two more and we’ll get a taste of the final product!